If your pond has green water or murky and cloudy water there is a solution! We have an all-natural, organic clarifier for your pond. Pond Clarifiers or flocculents, will help to bind or clump single cell algae (which creates green water) or suspended solids like clay and dirt particles, into larger masses that sink to the bottom, or in the case of small ponds, they allow your existing filter to remove them better and more easily. In many small ponds that have good filtration already, it's a simple fact that some of these "particles" are very tiny and while they may go into your filter system, they end up passing right on through. Large ponds often have no effective way to remove particulates, but with a good flocculent, you won't have to. Once added to the pond, the "floc" will make leaf debris, mud, clay, or other material, clump up and sink, clearing the water column effortlessly. We combine the use of the clarifier with a good beneficial bacteria to help clean up the organics from the bottom of the pond. 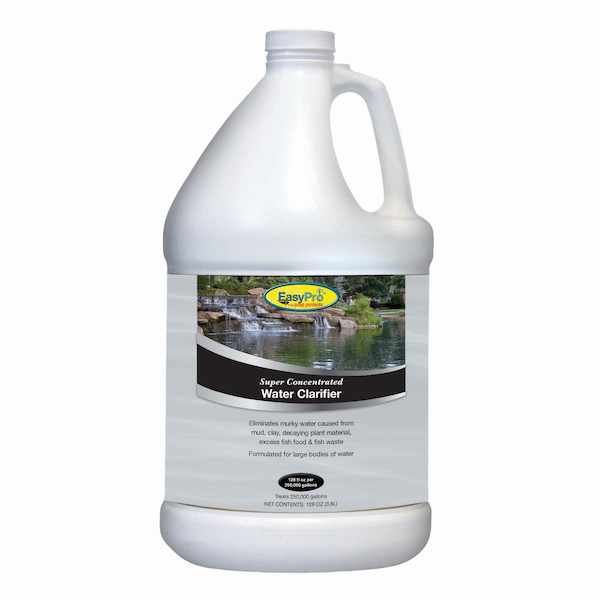 *Our pond clarifier is eco-friendly and safe for use around pets, fish, plants, and wildlife.